Do you have a countdown for Spring Break? I bet the days and weeks are flying by! Can you imagine it now: dinner with your family every night of the week, fun and games all afternoon long, a reprieve from the everyday tasks of work and home? Does your family prefer a vacation on the beach or time in the mountains? 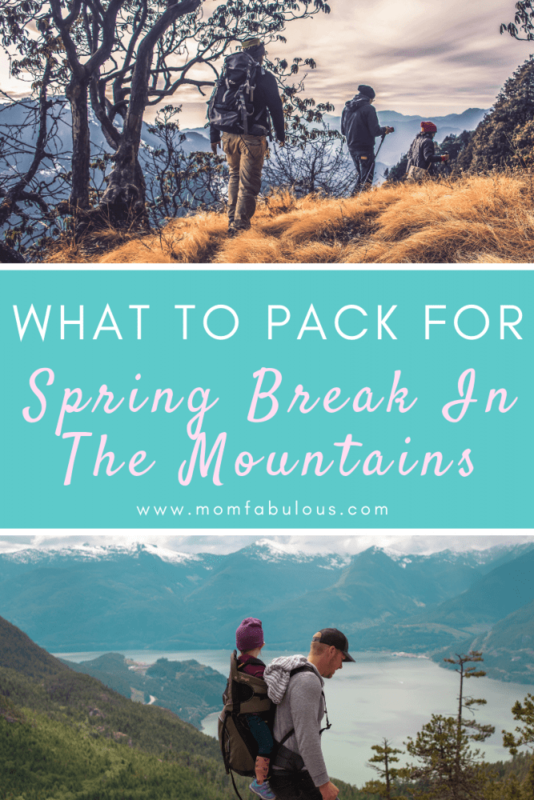 If your crew prefers the high altitudes mountaintop views, then you will appreciate this packing list for spring break in the mountains. Maybe the mountains that you plan to visit are covered in snow and dotted with skiers. Or perhaps the altitudes that you will be at are rocky, lined with trees, or covered with dirt trails. No matter the temperature or location, here are 5 essentials you will want for Spring Break in the mountains! Merino wool is the best thing since sliced bread. Seriously. It keeps you warm when it’s cold and it keeps you cool when it’s warm. It absorbs sweat (aka: you don’t stink). In addition to being moisture-wicking, merino wool is also water repellent, non-wrinkling and anti-static. Did we mention how that it’s soft and plush too! Umm…could a Mama ask for anything more in her clothing?!? If you’re spending Spring Break in the mountains, your bag won’t be complete without merino wool undershirts, leggings, and socks. You can read about our favorite Icebreaker merino wool undershirts here, including the perks of merino wool clothing. We recommend merino leggings and socks by SmartWool. A note about Mama’s budget: Wow, these items aren’t cheap! But they are highly effective and wear for a long lifetime (many reviewers comment daily use for 3-5 years before they wear out). If you can spare the change, these merino wool products are worth investing in before your Spring Break mountain vacation! Cute boots, hiking boots, and waterproof boots can be combined into one! Whether you’re an avid hiker who will ascent to the peaks, or a moderate walker who prefers short trails, or someone who just hops out of the car at the viewpoints, good shoes are essential for your mountain trip. Rain can move in and out quickly. Mud or puddles will be present. You’ll want to protect your feet from rocks, save your ankle from sprains, and cushion your soles on long trails. Don’t skimp on the shoes! Plus, they will last for years when you purchase a good pair. Try the Sperry Rain Boot, Keen’s hiking boots, or Brooks trail running shoes. Have you heard of the Boho Bandeau before? Mama, this small piece of fabric may change your life. It’s a mini infinity scarf that can be worn 12 different ways! From necklace to headband, scarf to bandana, hair tie to bracelet. It’s magical. Plus, you can pick your pattern from a variety of options, which means you will definitely find one to match your style. While you’re hiking, this can keep your hair out of your face and keep your ears warm. You can throw your hair up in a bun and be fashionable with these as a hair tie. Trust us – if you bring this on Spring Break, you won’t regret it! Altitude, cold air, and extended time outdoors can take a toll on your lips. You know how rough it is when you keep licking your dry lips and don’t have access to chapstick. Do yourself a favor and purchase an SPF chapstick to protect your lips from dryness, sunshine, and wind. You can’t go wrong with Lip Drink because it comes in multiple shades, while Dr. Bronner’s chapstick is all-natural (perfect for sharing with your hubby and kiddos when their lips get dry too). If you will be in the mountains from sun up until sun down, or perhaps only for an hour, it’s wise to bring along a bag. Stash your wallet and keys here, plus water and snacks, sunscreen, camera, a map, and any other small essentials your family may need while enjoying the great outdoors. Thanks for innovation, there are a few options for slim yet sturdy, packable yet room day bags. Try the Waterfly Sling Backpack for a one-shoulder small option. If you need a little more room, opt for the HikePro backpack. Both are lightweight, waterproof and pack inside of themselves. Wondering what else you need to pack? 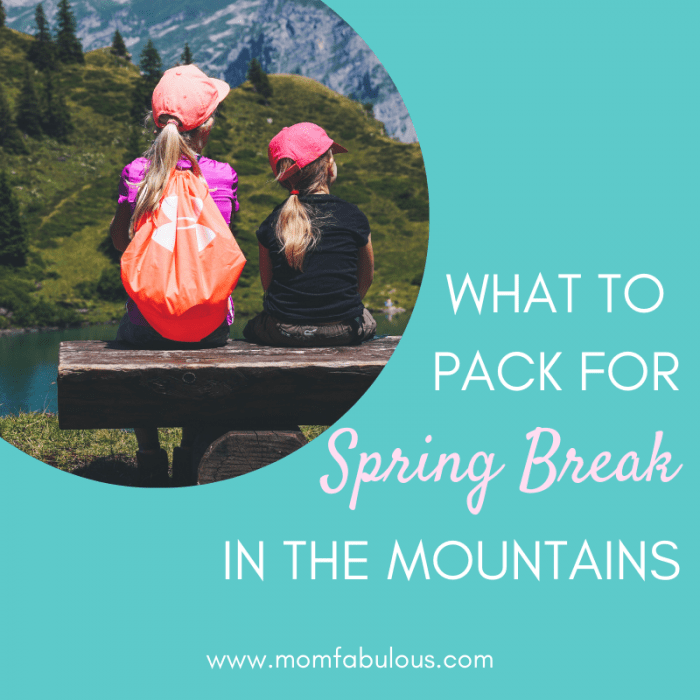 Here’s our suggested packing list for any Mama who will be spending a week in the mountains for Spring Break. Don’t forget to use packing cubes as a space saver and organizer. Pack the right clothing, including merino wool and a boho bandeau, so you can fully enjoy your Spring Break in the mountains!